A Few Thoughts on Rosa Bonheur's Use of Space in "Horse Fair"
Rosa Bonheur's fantastic "Horse Fair" is a massive canvas that caused quite a stir when it first appeared at the Salon in France back in 1853. Standing in front of the painting today at the Met, the effect of the circling horses was dizzying. I could almost hear the commotion and clatter of hooves. The visceral sense of "being there" is accentuated by the way Bonheur constructed her painted space. 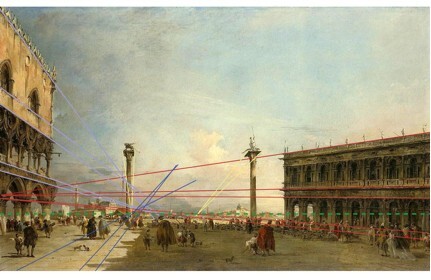 The panoramic sweep of her canvas seems to adhere to this Hyperbolic perspective grid. Imagine that these black silhouetted figures are all standing in a perfectly straight line from left to right. I've exaggerated the effect a bit in the illustration, but to the real-world viewer it would appear that they shrink towards the horizon line as they get further away from us. We know that the line they are standing on is straight, but it appears curved in reality. Our brains do lots of similar tricks, lining up our reality with what it knows to be true rather than what it actually sees. Imagine you arrived late to a movie and you're sitting in the front row of the theater, squashed all the way over on the furthest seat to the right. A giant square shape appears on the screen. Your brain knows for certain that that's a square, despite the fact that it looks nothing like one from your current vantage point. You can see the same effect in this stitched-together panoramic photo I took of Storm King seen from Breakneck Ridge. It's not a bend in the Hudson river you're looking at here. It's just that it adheres to the same "optical" grid as Bonheur's painting whereby objects in the center appear larger (because they're closer) than objects to the distant left or right. This happens when we try and squeeze anything beyond about 60º (our normal - undistorted - field of vision) into the frame. In this case, the extreme distortion of the river is due to the 180º view. Linear perspective takes a simpler solution to the problem of how to represent objects in space. Its solution is Euclidean in that its geometry is based on straight lines. The standard approach would have us portray as the same size any objects on the same plane, perpendicular to the viewer. This works just fine when we stick to portraying a scene that's within the undistorted 60º field. When painting especially wide scenes we are faced with a dilemma. Maybe we just paint everything the same size (as in Solution 2 above) and let reality do the shrinking for us. If you've ever stood in front of Veronese's gigantic canvas in the Louvre you'll know that he had no need to artificially reduce the scale of his figures in paint. The outer figures are so far away from the viewer that they naturally appear smaller. It's not that painters didn't understand the problem. It seems that they simply found this fish-eye distortion unattractive, so (for the most part) they chose to ignore it and paint everything in straight line grids. Pierre Puvis de Chavannes chose to ignore the issue. He painted incredibly long paintings, where each figure was the exact same size. His "Allegory of the Sorbonne," painted as a mural in 1889, reads as a long decorative frieze rather than a painted depiction of actual space, and that's not just because it contains all those allegorical figures (symbolizing Eloquence, Poetry and Drama etc). De Chavannes' broad panorama is a simplified depiction of reality in that he chose to present all the figures the same size as each other. In reality, if we were positioned directly in front of the central figure of the Virgin, then all the figures to the left and right would appear to get smaller the further away from us they were. Unless we happened to be witnessing the scene through a pair of binoculars, that is. Then we'd be at a sufficient distance away from the action that it would indeed tend to appear as De Chavannes portrayed it: a flattened frieze with very little variation in depth, scale or value. But de Chavannes knew what he was doing, of course. He knew this was a mural, and was not meant to be experienced from a single, fixed viewpoint, like Bonheur's painting. He knew that people would be milling around the Sorbonne, experiencing his painting from various angles. A third solution is also possible: Why not just kind of blend the first two solutions together? You know: fake it a bit? Carle (Antoine Charles Horace) Vernet did just that. He painted "The Triumph of Aemelius Paulus" in 1789, as a bravura performance of pre-Revolution pro-Empire sentiment. Vernet painted the architecture in perfectly straight, horizontal lines, but his painting avoids the stiff frieze-like nature of De Chavannes. How? He manages to inject a little hyperbolic perspective into the scene in two ways. Firstly, the central figures are lower on the canvas than those to the left or right. This simple trick makes them appear closer (even though the are the same size as those to the left or right. It also approximates the optical effect we would have if viewing this scene in reality, in that figures to our distant left and right would appear closer to the horizon (and thus further away). I say he "approximates" because, in reality those peripheral, distant figures would also appear to be smaller. Vernet, however, defers to the same unnatural rules of linear perspective as Pierre Puvis de Chavannes in that he presents these peripheral figures the same size (Linear perspective tells us that figures on the same plane should be painted the same size). The second little trick he pulls to avoid de Chavannes' "frieze" trap is to reserve his strongest values for the central figures. Although the figures to the far left and right are painted the same size as those in the center, they appear to be further from us because they are painted with a narrower range of values. While he does use strong lights, his darks are greyed-out. This pushes the figures back in space. Anyway, there you have it. A few thoughts I had while strolling through the Met the other day. A comment by Annabel Armstrong on my last post got me thinking about this subject. One of the great benefits of working on an apartment literally across the street is that I get to spend my lunch break with this stuff. I've been neglecting my blog. Months eating snails on a yacht with Gwyneth Paltrow (she claims she's vegetarian), and arguing the benefits of being a locavore whilst faffing around the islands have left me vacant. There are important things going on in the world, but I can't think of one for the life of me. I should start a Foundation to alleviate all this intestinal bloating, but I pissed all my cash away on sangria. Patsy Cline troubled herself over the decision between "A Poor Man's Roses, or a Rich Man's Gold." At least she had options. I just plugged another $300 into a '95 Saturn. If a rich man offered me gold, I'd be cradling his nuts in a silver spoon. What the hell am I talking about? I've no idea. Here's another regurgitated diatribe about a topic I've only the scantest understanding of. You're welcome, freeloaders. Let’s generously acknowledge at the outset that Piazzo San Marco (above) is an early work by Guardi, and that his figures are more “freely handled” than by a master like, say, Canaletto. However, the buildings immediately strike us as being way too small for the scale of the figures. Or maybe it’s the other way around; the figures are too big. Either way something’s wrong. Let’s imagine that Guardi started this painting by drawing the buildings in perspective to set the stage, which is probably what he did. The detail (above) from his painting shows a small figure in a red cape, standing in one of the arches alongside the left side of the Piazza. The figure still looks a tad big for the arch, but if we assume for a moment that he is scaled correctly [and again, by “correctly” I mean “correctly relative to the main objects – the buildings”], then we can use that figure to create a relative scale for everything else in the painting. It was pretty hard to find a vanishing point in Guardi’s painting, as the building on the left appears to have a lower horizon line than the building on the right (!). In any case, I began by drawing two green orthogonal lines from the central vanishing point to the top and toe of the red figure in the arch, then continuing them out to the left. You can see that the queue of little black guys on the left all fall inside those same green orthogonal lines. All those little black guys are in correct perspective relative to the figure in the red cape, which is in scale relative to the building. They all adhere to the same perspective scale. So far, so good. 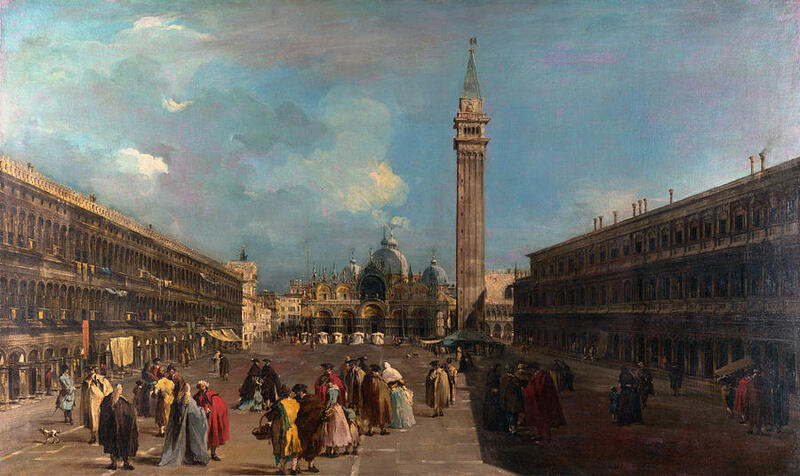 The problem with Guardi’s painting is that his foreground figures are massively out of scale with the buildings. Dragging the left-most little black guy across and into the central foreground, you can see just how off Guardi’s scale is. His main figures are roughly twice as tall as they should be, according to the scale he established with his buildings. The rule should be obvious: if you’re going to establish a scale by throwing a figure into your painting, then you had better stick to that scale. I threw that in bold because yeah, I'm shouting. 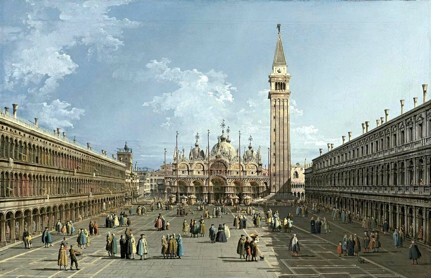 Bernardo Bellotto (above) did a better job placing convincingly scaled figures within his streetscape of the same Piazza. In case you think I’m being unfair to Guardi (by calling him a hack, completely was unencumbered by talent), check out this next painting. I lost count of the amount of horizon lines. Vanishing “points” are all over the place, orthogonals converging only vaguely at best. If he scribbled this on the back of a napkin after a carafe of cheap hooch, you might be inclined to write it off as merely the onset of alcohol-induced idiocy, but it’s actually on canvas. Why he bothered, I’ve no idea.